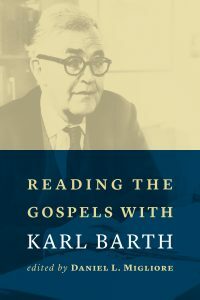 There are quite a few introductions to Barth and I look forward to seeing how he interprets Barth. 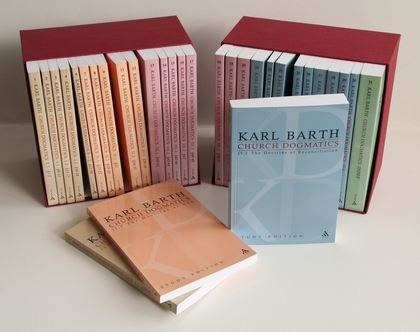 His approach is to give an overview of each volume of Barth’s Dogmatics, and then provide a brief reflection. Because I am lecturing on Karl Barth this semester, I have already started reading sections of Nimmo relevant to my lectures, along with the magisterial treatment of Barth’s theology by Eberhard Busch (The Great Passion). 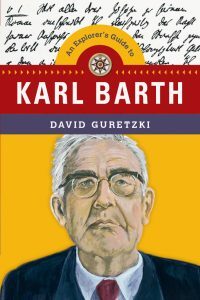 Finally, I have been sent a review copy of David Guretzki’s An Explorer’s Guide to Karl Barth which I need to read and review in the near future. 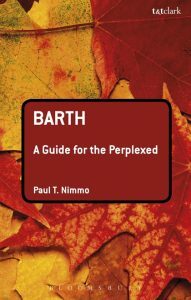 This looks like a very different kind of introduction; Guretzki appears to have written for the novice approaching Barth for the first time, and it will be fun to read his book alongside the more formal treatments by Nimmo and Busch. The first hour really was arriving, preparations (including learning some songs), and getting settled. Shortly after midnight we all (except mum) exited the building, and the lights were turned off. Outside a fire had been prepared and there was a short liturgy involving prayers and the lighting of the main candle, and then each of us with candles lit entered the darkened church, playing on and enacting the obvious symbolism of the gospels, especially John. The next two or three hours were given over to Scripture and worship. Nine readings in three sets of three were read, seven from the Old Testament, one from Paul, and one from Matthew’s gospels. Each reading was introduced with a short orientation and admonition, read, and then a song of worship was sung, the song itself echoing or extending the theme of the reading. There was obviously one other reading but I cannot remember it now. After the first set of three, participants were invited to “resonate.” This is to offer one’s own reflection on the readings, with a particular focus on how it is speaking to oneself. After the second set of three, children present had opportunity to ask their parents “tough questions” about faith. Some of the questions really were tough and put the parents on the spot! They answered well. The third set offered another opportunity to resonate. Then one of the priests offered a short and encouraging homily. Two babies were baptised with the full liturgy of corporate prayer and response, the dipping (three times) of the naked babies in the font, including full submersion on the third dip, the anointing of the babies with oil, and their clothing in white, and the “splashing” of the whole congregation with the baptismal water in an act of baptismal renewal. There was evident joy in the congregation during this liturgy and bapism, including what appeared to me to be outbursts of spontaneous praise. It possibly was not spontaneous, but a practice cultivated in the community expressing their exuberance at “two new Christians tonight” as I heard one woman saying excitedly to another after it was all over. 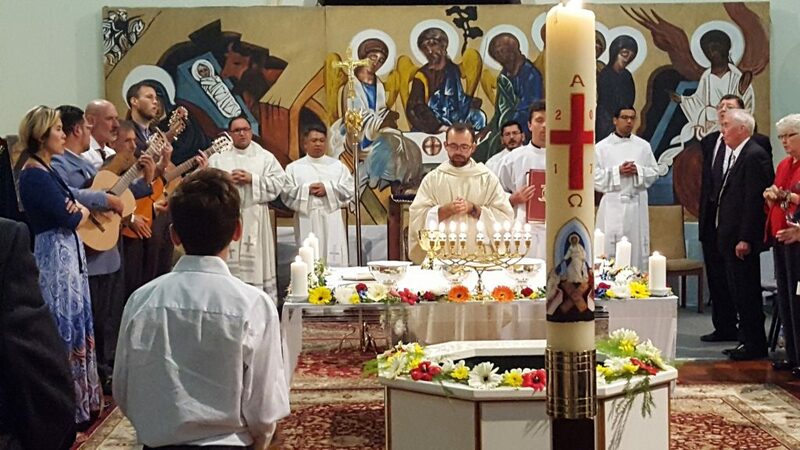 Finally, the Eucharistic liturgy was enacted (sung, as was the gospel “reading”) by the priests, with communion in both kinds being offered to all in the congregation, sometimes several times (to drink “all of it”?). The kiss of peace with much mutual affection was given all round, and the celebration finished with the chairs all pushed back, and a kind of folk dancing with lots of movement, joy and laughter. Early in the evening one of the younger women who has been a good friend to mum came up and said to her, “You are a hero!” I think she was referring to mum coming to stay all night to worship God, and wait on his Word. Another woman said to me, “You have the most beautiful mum.” Both women were right: I have the most beautiful mum, and she is somewhat of a hero. She has been walking faithfully with Christ for many years now, faithful in sometimes the most difficult of circumstances, faithful especially in her prayer, her consideration of others and her witness. It was mum who continually witnessed to and prayed for me, and her life and devotion continues to inspire. After the dancing many would go on to have breakfast together as the light of Easter day broke. These, however, had been enlightened already. I took mum home, and then headed home myself, tired enough to miss the freeway exit! I missed church at my own church that day—which Monica tells me was a wonderful service. But actually, I didn’t miss church at all. My mother has been a devout Roman Catholic all her life and raised me in the Church. Unfortunately, I have been a wayward son, leaving the Church for a different branch of Christianity, and migrating through several forms and denominations over the years. My mother has had her own journey within the Church, the Roman Catholic Church being large and diverse enough to accommodate a variety of forms within its overall structures. In the early 70s she became an early participant in the Catholic charismatic movement. Later, she became more deeply involved in a covenantal community movement within the church although, on account of her family, she never actually joined the community. More recently, which means in the last decade or two, she has participated in the Neocatechumenal Way, or the “Neo-cats” as she sometimes calls them. 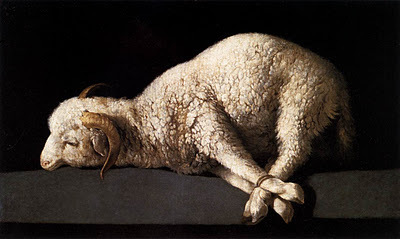 Each Easter Saturday for quite some time now, mum has attended an all-night vigil on Easter Saturday (after the foot washing on Holy Thursday, and Good Friday services!). We would arrive sometime on Easter Sunday for family get-togethers, and mum will have been up all night and still going, preparing the house and the food and welcoming us all in. 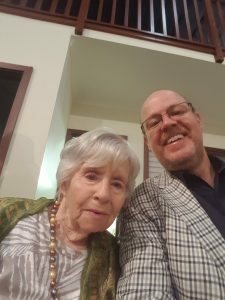 Mum is in her mid-eighties now, and though increasingly frail, still very much alert and sociable. But after a full day out with one of my brothers on Easter Saturday, she was tired and did not think she could attend the vigil; the logistics simply made it too difficult. I asked her if it would make a difference if I came along with her, stayed the night, and so, if she needed anything, I would be there to assist. She said she would have a rest and call me back. She called back within five minutes—no time to rest! I picked her up later that evening and we arrived at the vigil about 11pm as things were just about ready. Once mum was seated she didn’t get up for almost seven hours! (Getting up and down is pretty difficult.) Nevertheless, she loved every minute of it. It was my first time at the vigil. So what was it about? First, it was a combined celebration with, I think, four distinct catechumenal groups meeting: two from the Cathedral, one from Kelmscott (or were there two groups from Kelmscott? ), plus the newest group, from St. Kieran’s in Tuart Hill, who also hosted the event. There were perhaps 60-80 people present, including a good number of children. It was very multi-ethnic and multi-cultural, perhaps an indication of the strength of Catholicism in non-Western contexts, though there were also a good number of “typical Aussies” there (sorry for that; everyone there was likely an “Aussie.” I will have to find an expression that conveys accurately, those with an Australian heritage going back several generations!). 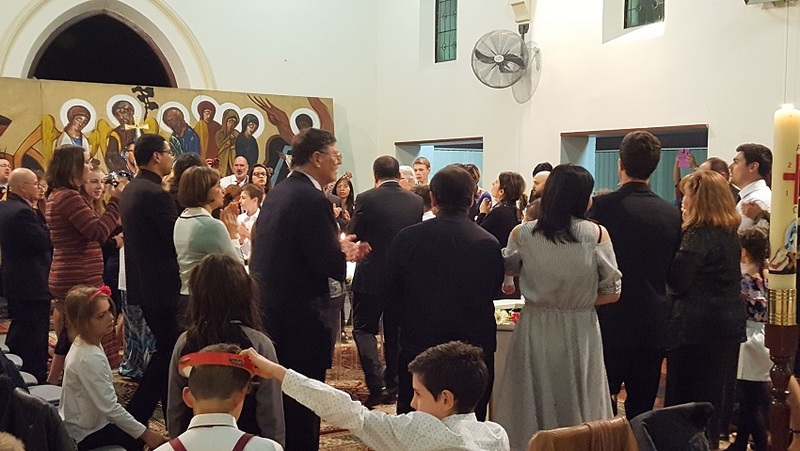 The evening seemed mostly led by laity, both men and women participating in readings, exhortations, and worship. A number of priests were present but their participation was quite limited apart from the formal aspects of the mass. It was clear that those present were very ordinary in terms of work, relationships, family, schooling, and financial responsibilities, dealing with the struggles and joys of life common to just about everyone. The youngest were infants, mum amongst those most elderly. There were not many teenagers, though I do know that a number of the young family groups became involved in the community when they were teenagers. What set these otherwise quite ordinary people apart was their faith, their sheer devotion to Christ and to their Church. Also evident was a sense of genuine and at times quite exuberant joy, tempered but not constrained by the liturgical form the evening took. Also prominent is the love of the group which I have previously noted in the way the group cared for my mother after my father’s death, and the way in which they have long included her in their communal life, assisting that inclusion with very regular and practical support. The Neocatechumenal Way emphasises liturgy, Scripture and community with a focus on Christian formation in the tradition of the catechumenate of the ancient church. Given that the Roman Catholic Church practises infant baptism, it is a largely a post-baptismal formation. They also emphasise worship and vibrant communal singing, for the evening was full of it. The worship style was a particular kind of folk music, based on guitar and percussion: not an electronic or electric instrument in sight. The simple rhythms made it easy for the kids to join in too, with each kid able to play a variety of percussion instruments during the night. What I observed on Saturday evening-Sunday morning indicates the rich fruits of this formational activity, and suggests, to my mind, the crucial necessity of such formation in the increasingly hostile environment in which the church exists in the contemporary west. I could not help but be reminded of Stanley Hauerwas’s continual emphasis that the church must become of community of people capable of forming others in the practices that sustain a truly Christian existence and witness in a world torn and suffering and idolatrous. A little anecdote captures something of the evening for me: during one section of the proceedings the children present were invited to pray (and many did), the community as a whole responding, “Lord, hear our prayer.” One little girl aged perhaps eight or nine, prayed for those present, for the babies who were baptised, and “for all those sick and suffering,” that they might be helped by God and by others. Already she was learning that to be a Christian is to pray, and to care, to be aware of the needs of others, and of the necessity of responding to their need. So what did they do for over six hours? Stayed tuned! 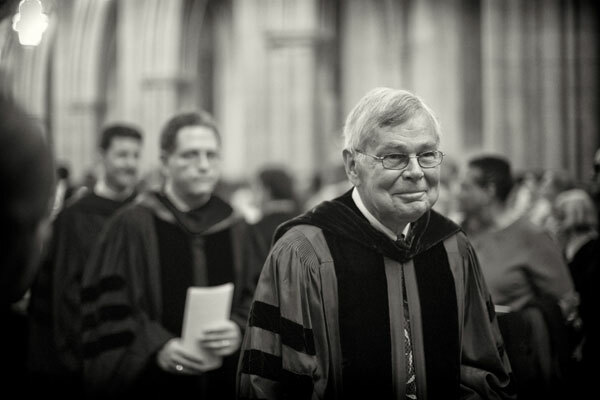 In his primer to bioethics (Bioethics: A Primer for Christians), Gilbert Meilaender argues that children are a gift from God, the fruit of a loving union, and so their existence is a result of procreation – of the love that precedes their begetting. He is wary of technologies that facilitate reproduction not least because practitioners may tend to think of children in terms of a product or a commodity, something to be produced like an item in a factory. Dangers here abound. Parents can tend to think of their children in terms of ownership (our child) rather than in terms of a task and a responsibility that has been given. Increasingly, technology can offer the possibility of designer babies, screening for defects, gender selection, and other options. As such, a child is produced, and the child’s worth may be considered as something achieved rather than in terms of inherent and inalienable right. Meilaender is clearly very ambivalent about Christian use of assisted reproductive technologies, and comes close to saying that Christians should not utilise these means. He draws a firm boundary against the use of third parties in reproduction. 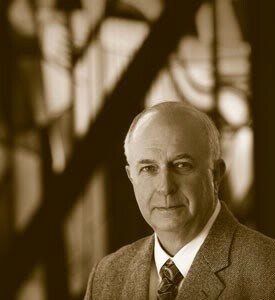 Pastorally, he calls the couple experiencing difficulty in bearing children to walk a tough path; it presupposes they have a very strong commitment to trust in God and walk out God’s purpose for their lives possibly without children, to suffer this sadness, and perhaps, to do so in the midst of a supportive community of fellow-travellers. As embodied creatures we need to know ourselves as those who occupy a fixed place in the generations. “Lines of kinship and descent locate and identify us, and, unless we learn to accept such a limit on our freedom, we remain alienated from our shared human nature” (13). To learn to affirm and give thanks for our place in lines of kinship and descent is to begin to learn how to give thanks for the mysterious gift of life. We learn to accept and rejoice in our limits, our creatureliness, and we learn gradually to relinquish the secret longing to be more than that. Meilaender describes the act of human love in terms of passion and ecstasy, a “going out” from oneself, an act of mutual self-giving and self-spending that issues in the creation of another like us and of us, equal to us in dignity. Thus the couple’s love-making has become life-giving. “The act of love that overcame their separation and united them in “one flesh,” that directed them out of themselves and toward each other, creates in the child a still larger community—a sign once again that such self-giving love is by God’s blessing creative and fruitful. That Meilaender argues along these lines suggests that he takes a teleological approach to marriage in which marriage includes procreation as one of its fundamental goods. A couple of months ago I purchased two new audio books to listen to while cycling. Often, while cycling, I listen to novels: they do not seem to demand as much concentration. Listening to non-fiction is harder, and I seem only to get a portion of what I am hearing. 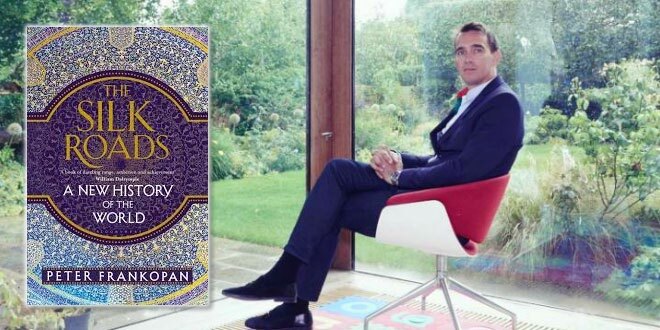 The first of the books is Peter Frankopan’s The Silk Roads: A New History of the World. The sub-title indicates the bold, perhaps grandiose, vision of the book. Of course it is impossible to write a complete history of the world; that would be beyond any possible scholarly capacity. Frankopan, however, has achieved much of what he has set out to do. Frankopan’s history is deeply fascinating and somewhat depressing. He manages to include enormous detail and great sweeps and movements of history as he exploits the imagery of the “silk road.” The origin of the term refers, of course, to the trade routes linking China to the west so that silk production in the former might find its way to the latter. In Frankopan’s hands, the silk roads become the “road to heaven” (the crusades) and the “road to hell” (the Black Death or the plagues). He speaks of the “slave road,” and the “road to the Christian east;” the roads of furs, gold, silver, and black gold. The roads to compromise, genocide, and super-power rivalry; the roads of catastrophe and tragedy. There is much in the book to inform Christian interest in church history, though Frankopan seems to regard religion as a human capacity. His treatment of the modern world, as expected, is more detailed than that of the ancient world. The British are portrayed as a particularly wicked empire, followed closely by the Americans, though Hitler is worst of all, simply and utterly evil. In contrast to the British, other brutal tyrants of history such as Genghis Khan seem almost tame by comparison. But perhaps I missed some of Frankopan’s nuance, due to the cycling. So why was it somewhat depressing? Because the story is one of warfare, conquest, exploitation, bloodshed, and tyranny, and all this based on economics and the desire for power or glory. While trade has certainly opened up the world and brought its varied peoples into contact and communication with one another, it has also opened doorways to violent military conflicts that have devastated entire peoples and regions. As I listened I was glad for relatively recent developments in international relations and law which serve to constrain some of these worst impulses, though obviously not entirely. I was also very aware that the privilege I enjoy as a member of a first-world society has been funded at least in part by injustice in previous generations and centuries. Is there hope that the future might be different from the past? Might new systems and mechanisms of trade and development emerge that somehow privilege the under-developed nations and allow them to space to prosper, even if “economic growth” and “standards of living” in the wealthier countries do not continue to grow at the rates we seem to desire? Might warfare and violence be constrained, and its devastating impact on civilian populations (especially children) reduced? Can the international community find better ways of relating than via stand-off and conflict? I am not overly optimistic about this. It seems humanity is fatally incapable of learning that the way of hubris and greed leads inevitably to destruction, both for others and ultimately, for oneself. Perhaps works like Frankopan’s will help stimulate deeper reflection across many constituencies, and so result in new movements towards peace and justice. Such movements are welcome and are to be encouraged. 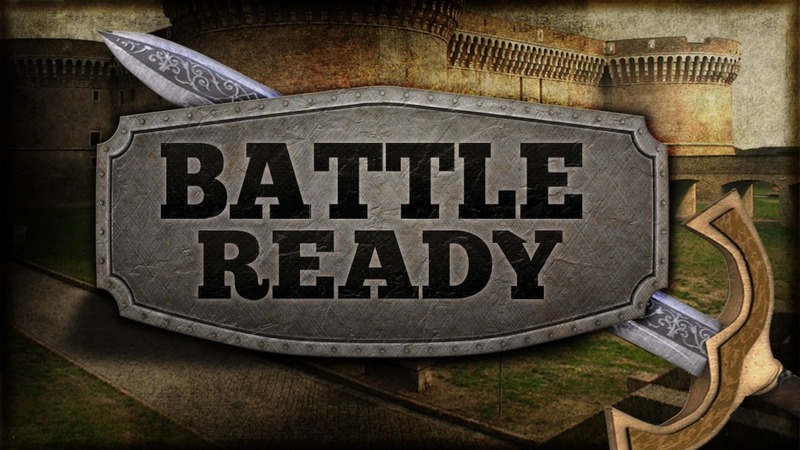 In the end, however, I find I hope most in the eschatological and apocalyptic vision of the New Testament: that is, I hope for the return of Jesus Christ and the establishing of the kingdom of God. As Christians, it is this in which we hope, this that we are to image now in our life together, and this that we are to work toward. I found this a very worthwhile book, one I will listen to again. I have also bought a Kindle edition and hope one day to read it as well. I can recommend it.